Abstract. We propose a satellite mission that uses a near-nadir Ka-band Doppler radar to measure surface currents, ice drift and ocean waves at spatial scales of 40km and more, with snapshots at least every day for latitudes 75 to 82°, and every few days for other latitudes. The use of incidence angles of 6 and 12° allows for measurement of the directional wave spectrum, which yields accurate corrections of the wave-induced bias in the current measurements. The instrument's design, an algorithm for current vector retrieval and the expected mission performance are presented here. The instrument proposed can reveal features of tropical ocean and marginal ice zone (MIZ) dynamics that are inaccessible to other measurement systems, and providing global monitoring of the ocean mesoscale that surpasses the capability of today's nadir altimeters. Measuring ocean wave properties has many applications, including examining wave–current interactions, air–sea fluxes, the transport and convergence of marine plastic debris and assessment of marine and coastal hazards. How to cite: Ardhuin, F., Aksenov, Y., Benetazzo, A., Bertino, L., Brandt, P., Caubet, E., Chapron, B., Collard, F., Cravatte, S., Delouis, J.-M., Dias, F., Dibarboure, G., Gaultier, L., Johannessen, J., Korosov, A., Manucharyan, G., Menemenlis, D., Menendez, M., Monnier, G., Mouche, A., Nouguier, F., Nurser, G., Rampal, P., Reniers, A., Rodriguez, E., Stopa, J., Tison, C., Ubelmann, C., van Sebille, E., and Xie, J.: Measuring currents, ice drift, and waves from space: the Sea surface KInematics Multiscale monitoring (SKIM) concept, Ocean Sci., 14, 337-354, https://doi.org/10.5194/os-14-337-2018, 2018. 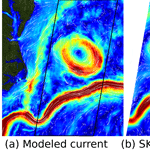 The Sea surface KInematics Multiscale (SKIM) monitoring mission is a proposal for a future satellite that is designed to measure ocean currents and waves. Using a Doppler radar, the accurate measurement of currents requires the removal of the mean velocity due to ocean wave motions. This paper describes the main processing steps needed to produce currents and wave data from the radar measurements. With this technique, SKIM can provide unprecedented coverage and resolution, over the global ocean.